The 26-year-old kicked a goal for the Crows in last month’s AFLW Grand Final. 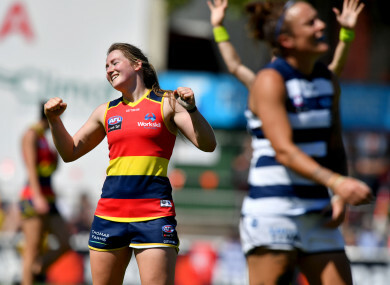 Ailish Considine of the Adelaide Crows reacts on the final siren following the Round 3 AFLW match between the Crows and the Geelong Cats in February. CLARE’S AILISH CONSIDINE is one of eight players to have re-signed with women’s AFL champions the Adelaide Crows, the club has confirmed. Considine kicked an early first-quarter goal as her side powered to a 45-point win over Carlton in the Grand Final in front of over 53,000 fans last month. Following an impressive debut season in Aussie Rules, the former dual star has re-signed as a rookie with the Crows. She becomes the second Irishwoman to extend her stay Down Under in less than a week, with Tipp’s Aisling McCarthy signing a new one-year deal with the Western Bulldogs last Friday. Considine, 26, is staying on with the Adelaide outfit along with co-captain Chelsea Randall, midfielders Anne Hatchard, Renee Forth, Justine Mules and Hannah Martin, winger Deni Varnhagen, and forwards Eloise Jones and Chloe Scheer, all of whom have either signed on the dotted line or have declared their intention to do so. “It’s really pleasing that Anne, Deni, Eloise, Justine, Chloe, Renee, Hannah and Ailish believe our environment is the best one for them as players and people,” said Crows general manager, Phil Harper. Renee, Hannah and Ailish came into our club from different backgrounds. They all bought into our culture immediately and played important roles in our team success. Kilmihil forward Considine signed a professional rookie contract with Adelaide last September, off the back of the CrossCoders camp which saw 11 Irish athletes trial for AFLW deals in Melbourne. She is the younger sister of Irish rugby international Eimear Considine, who also played GAA into her 20s before switching to an oval ball. Email “Clare's Ailish Considine re-signs with AFLW champions Adelaide”. Feedback on “Clare's Ailish Considine re-signs with AFLW champions Adelaide”.